The Isle of Wight is a dog walkers paradise and visitors to the island who choose to bring their pets with them on holiday can enjoy wide open spaces, countryside walks and a runs along the beach. However during the summer holiday season (May - September) some of the islands most popular and busy beaches have restrictions in certain areas and dogs are not permitted. Out of season dogs are permitted in these areas but please be responsible and clean up after your pet. 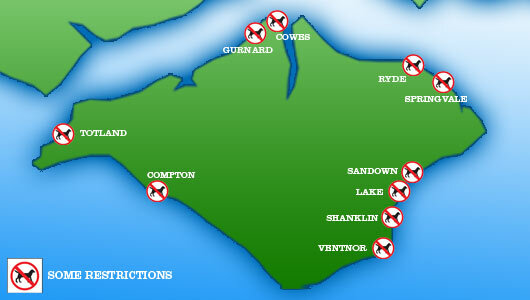 Below are the beaches which restrict dogs. Between 1st May and 30th September persons in charge of dogs (other than a registered blind person in charge of a dog) must comply with local Council Byelaws for the regulation of dogs on the beaches and the esplanades and removal of canine faeces on areas of beach, esplanades and public parks and gardens. Failure to do so will constitute an offence liable on summary conviction to a fine. This web page summarises information that is generally asked for by visitors. Full details of the Isle of Wight Council Byelaws are available at Council offices. Throughout the year, no person in charge of a dog, other than a registered blind person, shall permit a dog to be on any road, including esplanades and revetments, unless the dog is held on a lead and is restrained from behaviour giving reasonable grounds for annoyance.